My rating: 8.5/10. 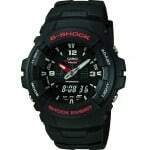 A tough durable chronograph radio controlled watch with triple sensor technology. Hello, today I’m doing a G-Shock Rangeman Casio GW9400-1 review. 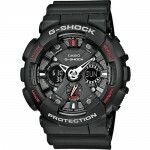 This is a very popular G-Shock watch that proved an instant hit when it came out. Not often do brands succeed so much with an initial design for a new timepiece like this. This is a feature rich timepiece that offers excellent value for money in my opinion. I hope you enjoy this G-Shock GW9400 review below. 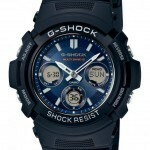 Everyone knows that G-Shock excels when it comes to large durable watch designs. The G-Shock Rangeman is of course, no different. It features a stainless steel casing to house the components of the watch, this is then surrounded with a thick resin that offers a great level of shock protection. The G-Shock Rangeman is designed to withstand the ‘Triple 10’ this concept means the watch aims to withstand a 10-meter free fall, have a 10 year battery life, and a 200m water resistance rating. The casing of the G-Shock Rangeman has a diameter of 53mm making it a pretty damn large watch. The thickness of the casing is 18mm which is pretty chunky, ensuring it will stand out on your wrist. 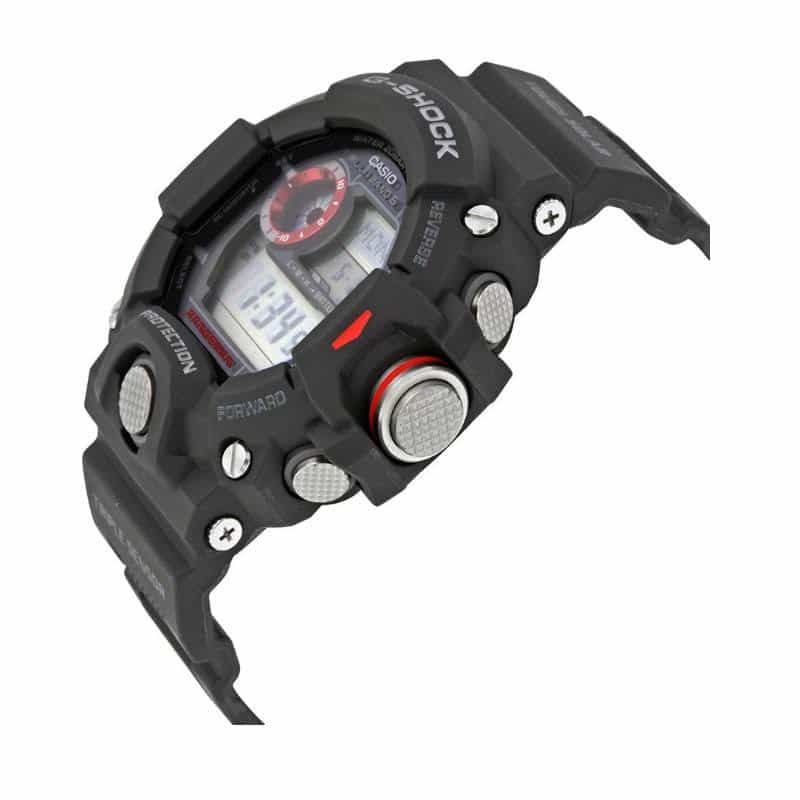 The dial is made up of a large LCD digital display which is used to display the huge amount of functions that the Casio G-Shock Rangeman features. I’ll discuss all the available features in more detail below. Many of these features are quite self-explanatory and I’ll explain more about the radio controlled atomic timekeeping in the movement section. For those that don’t know, a perpetual calendar doesn’t require any altering each month like a normal calendar can do, it’s actually a pretty handy feature, though often found in most digital watches. Protecting the front of the watch is a mineral crystal glass lens. This is perfect for this type of timepiece as it offers a good level of resistance from both scratches and shattering. Whilst a more expensive sapphire crystal glass offers better resistance to scratches, the mineral glass offers much better shatter protection which is why you often find it used even in the most expensive G-Shock watches. 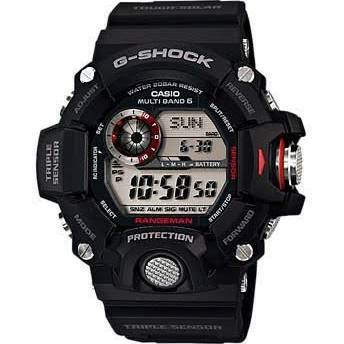 Powering this G-Shock GW-9400 watch is a Tough Solar movement that makes use of Casio’s Multi Band 6 technology for excellent timekeeping. Tough Solar watches harness light energy be it natural or artificial and use a solar cell to transfer this into electrical energy to power a quartz type movement. The Multi Band 6 technology ensures that the watch stays incredibly accurate by syncing with an atomic clock via radio signal reception in the EU, USA, Japan, or China. Why not check out more of the best atomic watches here. The strap of the G-Shock Casio 9400 is made of a thick comfortable rubber with a width of 21mm, this works well with the larger casing design in my opinion. 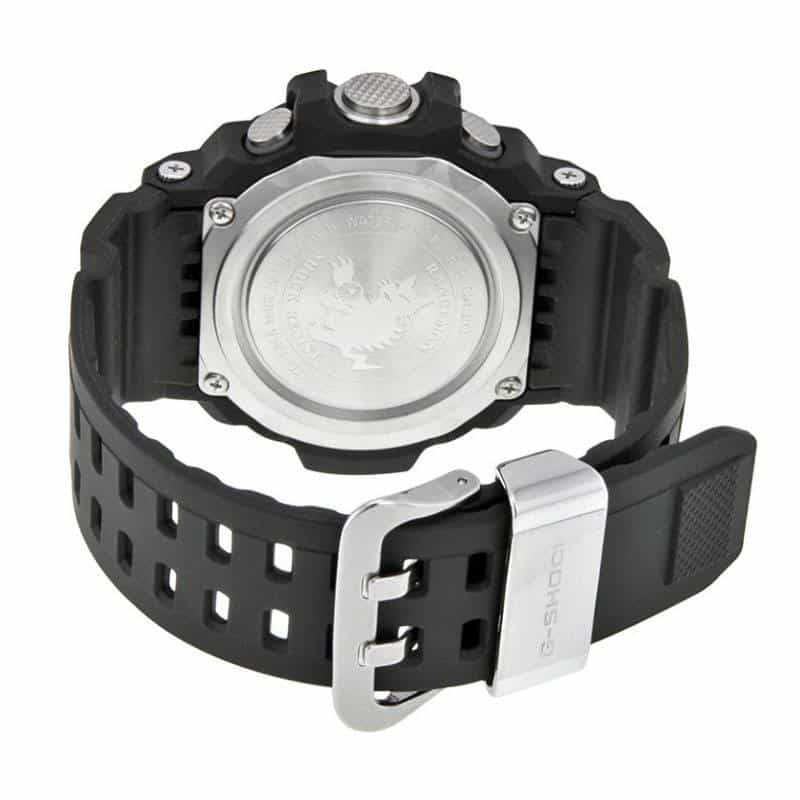 It fastens with a double tang buckle with a stainless steel clasp for a sturdy fit on your wrist. This watch has a 200m water resistance rating. A 200m or 20 bar rating makes this watch suitable for professional marine activity, serious surface water sports and skin diving. So that’s pretty much everything you need to know about the G-Shock Rangeman, of course if you do have any questions you only need to comment below and I’ll reply with an answer as quickly as I can. Personally, I feel the Casio Rangeman GW9400 offers excellent value for money, the watch is very well built and offers a whole host of features that’s perfect for anyone with an active outdoor lifestyle who needs a watch as hard wearing as they are. Hope you enjoyed this Casio 9400 review. Why not check out our best minimalistic watches next.